How to Build a Great Sled Run! Thank you for joining us and welcome to our newsletter! I'm excited that we've released our Premium Metal Runner Snow Sled, The Alpine Classic, as our flagship offering from Molson Runner Sleds and we were able to source, manufacture, and assemble them 100% in the USA. That being said, I feel it's important to discuss How to Build a Great Sled Run. Once you've determined where your run will be, you have numerous choices as to how you'll go about tracking in your run. Sled it: If you have a good base and some fresh snow, or a nice hard pack, you can start right in! Tube it: We've always found success hitting the run a few times with a snow tube first to be a great way to start a run. This helps pack the snow and speeds up the run creation time considerably. Snowshoe it: If you sled in an area that receives a high frequency and depth of snowfall, this is your best bet for creating a great base and enjoyable run. We found that packing a 2-4 snowshoe width path (1-2 people wide) does the trick. Usually a couple trips, will pack in a nice firm run. As more snow falls throughout the season, touch-up the pathway to keep it in prime sledding condition! Create a walking path a safe distance from the run,. This is just a great way to prevent accidents and also keep the sledding path free of boot-pack post holes! Ensure your run-out area is free of obstacles and obstructions. Our sleds are very fast (During the Wall Street Journal test titled "The Five Best Snow Sleds", our sleds were clocked at over 55 mph) so you want to ensure you have a safe area to slow down and stop. After multiple runs, add snow to any low spots and use a shovel to shave down any high ones. 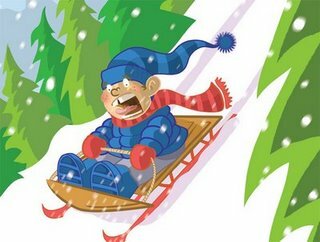 Now that you've built a great sled run, go have some fun! For those with a competitive side, try building 2 runs a safe distance apart so you can race! » How to Build a Great Sled Run!